I would like to start off by quoting Marion Francis the outside management consultant who was engaged using DTAS investment to take the town centre charrette forward. Due to unforeseen circumstances, we’ve had to re-schedule the Drop-in Session and evening presentation. This will now take place on the 3rd March, 2-5pm in Community Centre and 7.30pm in the evening. The AGM will take place on the 30th March. Notifications will be sent to all members soon. Reports of the demise of NICE have been greatly exaggerated, but understandable given that NICE has been unable to put much into the public domain. The key difficulty was that identifying the mechanisms for delivery and the fundamental need for collaborative working were not easy to achieve in the prevailing climate. Despite that, we have been exceptionally busy behind the scenes for the last 18 months, and can now report on two significant projects – seeking “BID” status for Nairnshire, and driving the Town Centre Plan forward. We are delighted that a new Planning Consultation from Scottish Government recognises that “People rightly expect to have a stronger say in the decisions that affect them and their communities”. Suggested changes to legislation will “Allow communities to prepare local place plans that set out where development requirements, as defined by the broader local development plan, can be met.” These ideas have always been central within the aims and objectives of NICE, whose principle purpose under its Constitution is to drive the regeneration of Nairn. 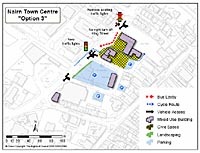 The Nairn Town Centre Charrette was facilitated by the Highland Council. With input from NICE’s community survey and the input of other business and voluntary groups, an agreed Town Centre Plan was developed and published in September 2015, but there was no strategy for delivering any of the agreed outcomes and for reasons not fully understood, it has received little public attention. Anecdotally there is little public awareness of its existence. For that reason NICE engaged the services of a highly respected consultant, funded by the Development Trust Association of Scotland, to look at the Charrette outcomes and identify options for taking them forward. Our consultant Marion Francis is now in a position to present the results of her work and consultation. We are pleased to invite our members and the wider community to an Open Afternoon drop-in session on the 3rd March (2.00-5.00pm) at the Nairn Community & Arts Centre so that we can refresh awareness of the Town Centre plans that were proposed by the Charrette process. We have invited the Highland Council planning team who prepared the Charrette report to be present and to chat informally to visitors and take feedback. A more formal evening session (7.30pm) will be given over to Marion Francis’ presentation of the options for the next steps with a timeline and strategy for taking forward the Town Centre Plan – the core mission of NICE. As the commentary in the Town Centre Plan itself states, it is up to the community to work with the statutory authorities to drive the project forward. One reason for the difficulty we faced was the fact that the strands connecting various community groups and initiatives were complex, and there are many community groups in Nairnshire. But we sensed that the climate had changed 18 months ago when the director of Scottish Government’s Business Improvement District (“BID”) department approached NICE with the proposition that Nairnshire should seek BID status. Alongside this, Highlands & Islands Enterprise (“HIE”) had also stated that “Nairn must speak with one voice”. We thought long and hard about ways to tackle the problems, and drew comfort from the fact that HIE are supportive of a BID for Nairnshire. The energy and commitment recently put into proposals for a new Lido/Thermal Spa, has resulted in HIE funding a feasibility study to determine if it might be a key driver for the local economy. There is good evidence that a well-researched idea with suitable financial support will succeed and give the wider community confidence in itself. Indeed, the recently opened Sun Dancer Restaurant is very popular, and the coffee & wine bar on the Brae has a distinctive offering. NICE invited Michael Boylan, Chair of the Association of Nairn Businesses, and Michael Green, Elected Highland Councillor, to join a Steering Group which has now secured funding of up to £50,000 to take the proposal to ballot using professional paid staff to do the work. A separate Press Release has just been issued about the BID, identifying the vital roles of The Highland Council and HIE in supporting the Government BID policy. We believe the opportunity to acquire BID status for Nairnshire is a real game-changer for our community. The fact that funding for the preparatory work has been secured confirms the outside perception at Government level that Nairnshire is a “sleeping giant” – a seaside tourist destination with great unrealised potential and worth investment. NICE’s role on the BID Steering Group is to act as enabler, and by virtue of its charitable and corporate status to be the funding conduit for the work. We believe that the BID project will underpin further work on the Town Centre Plan, and give potential funders the confidence that Nairn does on this occasion mean business. The full Nairn Town Centre Plan report can be accessed from the Highland Council’s website and also here – Download the full document here. We were all saddened to learn of the recent death of Graham Kerr. Graham was born and bred in Nairn. He cared passionately about his home town and on retirement devoted much of his time to making Nairn a better place for everyone – visitors and locals alike. He was determined to make the most of Nairn’s assets. Graham became a director Nairn Improvement Community Enterprise (NICE) in November 2011 and brought considerable professional and human qualities to NICE’s activities. His engineering background meant that he had a very pragmatic approach to all developments. He kept others grounded – it might have sounded like a good idea but would it work in practice – he forensically questioned many aspects of the town centre development; traffic management; drainage systems; housing development. Graham was known for his dogged persistence. He held people and agencies to account but always in a polite way. His concern was for his community, he was not concerned with personal status. In his younger day Graham kept a recreational boat in the harbour. In 2015 when one of the local councillors asked NICE to undertake a study of the harbour and seafront area Graham leapt at the chance to lead the project. He had an overall vision of how to improve Nairn and saw the harbour as an important local,and tourist focus, about much more than just boats. One of his ambitions was to help establish a marine life educational centre. A typical request from Graham might say “ if we can get a simple graphic to show the speed of the movement of the sand bar this must be a very good justification for positive action being taken to preserve the future of the harbour.” He was similarly concerned about coastal protection and flood risk and management. Graham’s contribution to NICE will be sadly missed by all his fellow directors as will his selfless desire to help the community and his home town of Nairn. You’ll find the report and Minute of the 2016 AGM on the Documents page. This is a discussion paper that looks to the possible development of a Nairnshire BID. It can only proceed with the agreement and participation of local businesses. It may take 15 months to define the terms of the BID and engage in consultation.